" In a climate such as Canada, the velocipede can only be used in half of the year only. An attempt at velocipeding during the winter when the streets are covered in frozen snow, would in all probability result in the same manner as Hans Brietmanns celebrated ride, much to the bewilderment and discomforture of the adventurous rider. An adaptation of the velocipede has recently been made by some enterprising individual which makes it a safe and easy mode of locomotion during the frosty weather. The ice-velocipede has but one wheel armed with short spikes which catch in the ice and considerably lessen the chance of slipping. The hind wheel is replaced by two small runners placed side by side, a few inches apart, and connected to the body of the machine with a stout iron bar. The manipulation of the ice velocipede is the same as an ordinary bicycle. 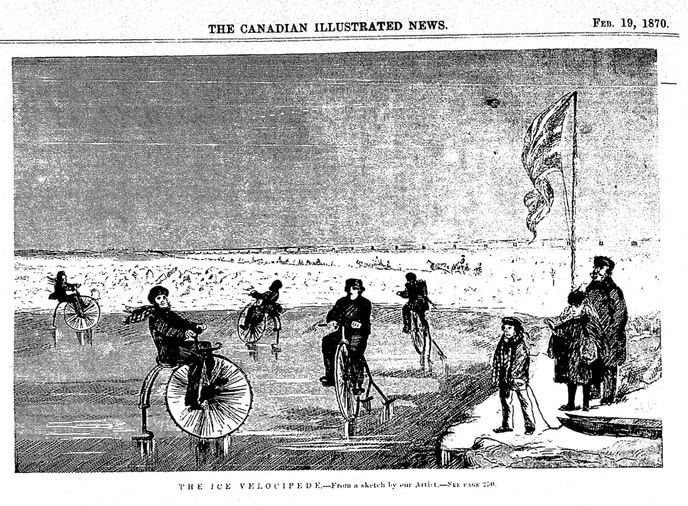 Our illustration represents an everyday scene on the river near Montreal where the ice-velocipede is in everyday use."